This MIDI tutorial will help you to understand how you can use the MIDI language to control any device that uses the MIDI protocol. 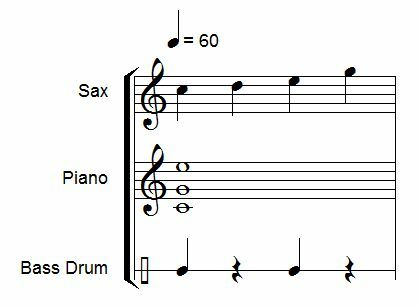 The MIDI language is used to transmit real time information for the playback of a piece of music. "Real time" means that each message is sent exactly at the moment it must be interpreted by the target synthesizer (which can be a hardware synthesizer or software synthesizer). Various messages are defined to transmit the information needed to perform the playback of music. The important point is that the MIDI language does not define the sound itself, but only the sequence of instructions to create the sound in the target synthesizer. The MIDI messages are sent as a time sequence of one or more bytes (8 bits). The first byte is a STATUS byte, often followed by DATA byteswith additional parameters. A STATUS byte has bit 7 set to 1 and aDATA byte has bit 7 set to 0. The STATUS byte determines the type of the message. The number of DATA bytes that follow depend on the type of the message. Except for some system MIDI messages, the STATUS byte contains theMIDI channel number. There are 16 possible MIDI channels, numbered from 0 to 15 in hexadecimal. In practice, musicians and software refer to the MIDI channels by counting them from 1 to 16, so that there is a difference of 1 when you program them in hexadecimal (channel "1" is coded "0", channel "10" is coded "9" and channel 16 is coded "F"). In the same MIDI cable, up to 16 MIDI channels may be used to control up to 16 different instruments playing independently. MIDI RUNNING STATUS While reading bytes coming from a MIDI message, you must know that the STATUS byte can in fact be omitted (except in the first message of that type). In such a case, you can receive a message that only has DATA bytes. The STATUS byte is then supposed to be the same as the last STATUS byte received. This is called MIDI RUNNING STATUS. It is useful for instance to optimize transmission when a long series of the same messages are sent. An example would be a pitch bend or crescendo volume curve. You can also use this MIDI RUNNING STATUS when you generate MIDI messages, but you should care about how the target synthesizer or software will receive it, to be sure it is well interpreted. The main messages are the NOTE ON and NOTE OFF messages. The NOTE ON message is sent when the performer hits a key of the music keyboard. It contains parameters to specify the pitch of the note as well as the velocity (intensity of the note when it is hit). When a synthesizer receives this message, it starts playing that note with the correct pitch and force level. When the NOTE OFF message is received, the corresponding note is switched off by the synthesizer. Every NOTE ON message requires its corresponding NOTE OFF message, otherwise the note will play forever. The only exception is for percussion instruments, where it can happen that only the NOTE ON is sent, as the percussion note stops by itself automatically. But it is better practice to send the NOTE OFF in every case, because you are not sure how it could be interpreted by the synthesize receiving it. To transpose a note one octave higher, add 12 to its pitch value. By using MIDI, transposition is very simple as it is done simply by adding or subtracting a fixed value. Be cautious however about the range of MIDI notes that goes from 0 to 127. By adding for instance 4 octaves (+48) to a note of value 96, the total is 144, which is outside the range and may be truncated to 16 (144 - 128) so that a very low note will result. In basic synthesizers, the velocity value is used only to determine the force with which the note is played, the only effect being a note that is louder or softer in volume. In more sophisticated synthesizer, this value will also affect the sound quality. Indeed, on a real piano, hitting a note harder will not only affect its loudness but also the quality of the sound itself, the timber. This is practically the case with any real instrument. There is a special case if the velocity is set to zero. The NOTE ONmessage then has the same meaning as a NOTE OFF message, switching the note off. where CCCC and PPPPPPP have the same meaning as above. The VVVVVVV is the release velocity, which is very rarely used. By default, set it to zero. When you send a NOTE ON message to a synthesizer, this note starts playing. Meanwhile, you can send other NOTE ON messages, with different note pitches, so as to hear a chord. However, you need to keep track of the notes that are playing, so that you can send a correspondingNOTE OFF for each note, otherwise there will be stuck notes playing forever. Let's take an example. What are the MIDI messages needed to play the following measure? "t" represents the time in seconds. The score plays at 60 beats per minute, so each quarter note is 1 second. Up to now, there is no information to tell the synthesizer what sound must be used to play the notes. The synthesizer would probably use the piano or its default instrument. where CCCC is the MIDI channel (0 to 15) and XXXXXXX is the instrument number from 0 to 127. Similarly to MIDI channels, you will often see that the instrument numbers in synthesizers and in GM lists, are numbered from 1 to 128 so you also need to add or subtract 1 for the conversion. For instance, the trumpet instrument has number 57 in the GM list, so in the above MIDI message you must set XXXXXXX = 56 to get the correct instrument in the target synthesizer. The notes sent to the synthesizer after that message will be played with a trumpet sound. Sound Quality of Instruments You will notice that the sound quality as produced by the target synthesizer has nothing to do with MIDI messages. After receiving a program change specifying the trumpet instrument, a cheap, low quality sound card synthesizer may play a pretty bad trumpet sound, while a high quality sampler may render a beautiful and realistic trumpet sound. This is the main problem with MIDI sequences, is that you have no control of the final quality of reproduction, as you do not know what is the synthesizer that will play it when you publish a MIDI sequence. Drum instruments form a special case, as they do not have a specific pitch like on a piano or trumpet. A specific MIDI channel is used to transmit the playback of drum instruments. In General Midi, it is channel 10, but you will find synthesizers that can be programmed to receive drums on any channel. In the case of a channel assigned to drum instruments (and also for special sound effects often included in synthesizers), the NOTE ON and NOTE OFF message information for the pitch is in fact used to select which drum or sound effect will play. By using different MIDI channels, you can define a specific instrument for each. By sending notes on the corresponding MIDI channels, these notes will sound with the given instruments. Here is a score example with three instruments. The sax, piano and bass drum will use respectively channels 1, 2 and 10. The MIDI message sequence is the following. For drums on General MIDI it is the program change 1 (coded 0) which is the standard drums kit. Some synthesizers also propose Jazz kits, Orchestral kits, Electronic kits,... with different drum sounds). Then we can send the notes as already explained. Notice that here, we have used the NOTE ON message with a velocity of zero, as the equivalent of the NOTE OFF message. This is often used in practice. where CCCC is the MIDI channel, NNNNNNN is the controller number (from 0 to 127) and VVVVVVV is the value assigned to the controller (also from 0 to 127). 1 = Modulation wheel, often assigned to a vibrato or tremolo effect. The volume change has an impact on all notes currently playing as well as the notes that will start playing later. The synthesizer keeps that volume level until another volume level is sent. Remember that the velocity of a note is sent with the NOTE ON message itself. The velocity cannot be changed once the note has been started, so you can use the volume controller to change the level of the note after it has been started. To create a crescendo, you need to send a sequence of increasing volume values. You must always balance out the velocity and volume values to use, so that both are in a correct range of value. If one of them is too low, the notes may not be heard correctly even if the other value is at its maximal value. The effect of both values are multiplicative to determine the real loudness of the note. As we have seen before, you can select a sound on a synthesizer with the 128 values of the program change message. The sound bank selection messages (LSB Least Significant Byte and MSB Most Significant Byte) are used in addition to the program change message. A synthesizer may contain one or more sound banks, each containing 128 sounds. If you want to use a specific sound bank of the synthesizer, you must first activate the new bank and then send the program change message. After receiving these messages, the synthesizer will play the following notes with that specific sound. As the MSB and LSB can range from 0 to 127, there is a total of 128 x 128 = 16384 possible sound bank to be selected. In practice, only a few are implemented. The information about the program change numbers and the sound banks available is to be found in the MIDI implementation chart and MIDI specifications of the synthesizer you are using. where CCCC is the MIDI channel, LLLLLLL is the LSB of the pitch bend value and MMMMMMM is the MSB. 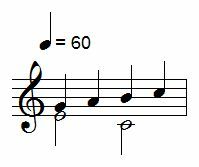 The 14 bit value of the pitch bend is defined so that a value of 0x2000 is the center corresponding to the normal pitch of the note (no pitch change). Using numbers above 0x2000 (up to 0x3FFF) will increase the pitch and using numbers below (down to 0x0000) will decrease the pitch. The range of pitch change is symmetric (up and down) and can often be adjusted in the synthesizer itself. The most common range value is +/- 2 semitones around the standard note pitch. Pitch bend is often used to create glissando and guitar bend effects. To achieve this, you must send a continuous sequence of pitch bend messages, to vary the pitch in real time, often enough so that the ear does not hear too much steps in the curve. Indeed, the value 0x3000 must be split into two 7-bit values, giving 0x60 and 0x00 for the MSB and LSB parts. As we have seen, all NOTE ON message should have its correspondingNOTE OFF message, otherwise the note will continue to sound forever. There are cases where you want to reset whatever notes are playing. There are basically 4 ways to do this. Some synthesizer do not accept them all, so it is interesting to offer the different possibilities. If you send a MIDI controller 123 on one MIDI channel, the synthesizer will stop all notes playing on that channel. To reset all MIDI channels, send that message for each channel. Please note that some synthesizer do not respond to this message. This is a one status byte message 0xFF, without data bytes. It should reset the synthesizer to its power-on default, so it also stops all notes playing. Use this message sparingly, as it reset the full synthesizer, not only the notes playing. You can also send, for each channel (0 to 15) and each note pitch (0 to 127) one MIDI NOTE OFF message. This is the total solution, but requires a lot of MIDI messages to be sent, which may have some reaction time according to the MIDI hardware system you use. In this case, use a table to keep track of the NOTE ON and OFF messages you send for each channel. A buffer of 128 bytes for each channel, representing the number of NOTE ON messages sent to that note,should be incremented by a NOTE ON and decremented by a NOTE OFF. Then, when you want to reset every note, simply go through that table and send a NOTE OFF to each note that is still playing. The above information covers the basic use of MIDI for many playback situations. To find all information about the more advanced MIDI messages and conventions, you can go on the site of the MIDI Manufacturers Association, that you can easily find with Google.